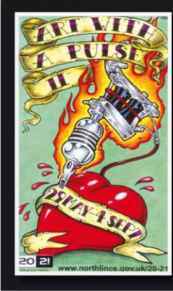 This is the second instalment of an art exhibition showcasing paintings of prominent tattooists from around the world. The idea behind the show is to showcase work from artists that have been influenced by tattoo culture, stained glass, mosaics, photography and other artistic mediums. The show will be 'on the road' exhibiting in many major towns, giving all a chance to see the stunning artworks up close and personal, some of the names showcasing their work are; Alex Binnie, Bez, Angelique Houtkamp, Dawnii, Jo Harrison, Jin O, Lou Molioy and many more. The show will take place at 20-21 Visual Arts Centre, Church Square, Scunthorpe, North Lincolnshire 20th May to the 4th September Opening times are from Tuesday to Saturday 10am to 5pm. www.noithlmcs.gov.uk/20-2i.